It has been a long long time since any furniture projects have been posted here. The reason is simple -- nothing worth showing was being made. I won't go into the reasons for my inaction or the reasons for its end but I finally did go back into the shop and produce something. 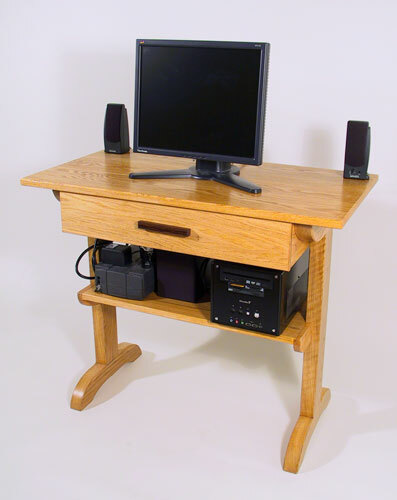 The result is a small and simple oak workstation designed to hold a small form factor computer which I built nearly a year ago and which has been living, very clumsily, on and in my dropfront cherry desk. The wood in the project is oak. Probably white oak but I won't swear to it since it was just something that has been mouldering on my wood rack for years and years. I'm not a great fan of oak for furniture but in this case ready availability as well as great strength were overriding values. I veered away from my normal style and headed in the direction of Arts and Crafts meets 1920 Dowdy meets late Shaker. The only ornamentation, if it can be called that, is a bit of a chamfer on exposed edges. Simplicity and strength were the principle aims. The strength comes from the mortise-and-tenon joinery of the supporting trestles of 1-3/4" oak and from the sturdy box which acts as a bridge between the trestles. The box is finger jointed at the rear and doweled at the two front rails and the box is, in turn, attached to the trestles with large lag screws and washers yielding a structure which should easily support at least twice my body weight. 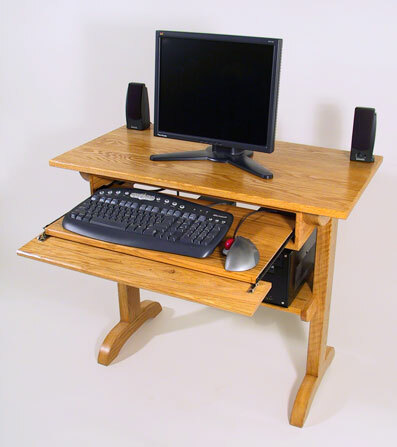 The keyboard drawer is supported on special slides sold by Rockler for this purpose. The front drops when it is raised about 1/8" and stops solidly in the dropped position. A quick look will reveal the the drawer is a bit narrow and this, if anything, is one thing I'd change in the design. It is certainly adequate for me since I use a trackball instead of a mouse but anyone needing mouse maneuvering space whould certainly need a few extra inches of width. I could have easily gone wider while maintaining the same overall size but I let the dimensions of the pre-existing wood scraps limit me rather than dragging out and cutting fresh stock. 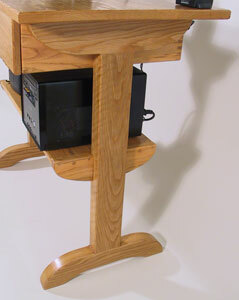 The shelf which holds the computer, subwoofer, and UPS is floating between the two vertical legs. It is kept from tipping by the curved brackets attached to each end. The shelf is supported by ½" hardwood dowels protruding from holes on the inside of the legs. Although there is only one position for now some fresh holes would allow for different shelf heights. I finally did make some more holes when I replaced the UPS unit with a taller one and the adjustment worked as intended. One feature was left out of the final project after a bit of consideration. I had purchased a large plastic "finger grommet" which is intended to allow cables to drop through a desktop. As it turned out the only cables involved, two thickish ones for the LCD monitor and three thin ones from the speakers, are so innocuous that the effort of piercing the top seemed excessive. As stated earlier, the overall material is oak of some sort. The pull is a simple bar of wenge made from scrap and which has chamfered front edges to match the rest of the design as well as a slight finger recess underneath. The finish is garnet shellac which serves to even out and slightly darken the oak and a water-based polyurethane topcoat. Overall size is 36 X 19 X 30 inches.